On 21 December 1988, a cowardly act of terrorism blew PanAm's Clipper Maid of the Seas out of the sky over Scotland. Flight PA103, en route from London to New York, carried 259 men, women and children, their bags heavy with Christmas presents for those awaiting their homecoming. As the blazing wreckage fell on Lockerbie, it claimed the lives of 11 residents, bringing the death toll to 270 people. The town of Lockerbie later shipped 270 blocks of locally quarried sandstone to America. Each block of the distinctive reddish stone represented a life lost in the disaster. The task of building these blocks into a memorial was undertaken by Frank Klein. A builder from New Jersey, whose daughter Patricia had been on PA103, Frank moved to Washington DC with some of his workers, and over several months lovingly erected the cairn that now stands in a secluded part of Section 1 in Arlington National Cemetery. 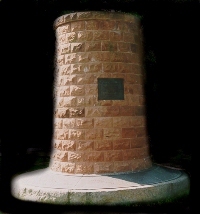 The Lockerbie Memorial Cairn was unveiled by Bill Clinton, the President of the United States. Among those attending the ceremony were the families of those killed, residents of Lockerbie, American and Scottish police officers, and many more for whom the horrors of those dark December days in Scotland will never fade. In a quiet corner of Lockerbie's cemetery is a Garden of Remembrance. It is lovingly tended by local people, who have adopted those victims buried there, vowing always to visit the graves on behalf of their families. 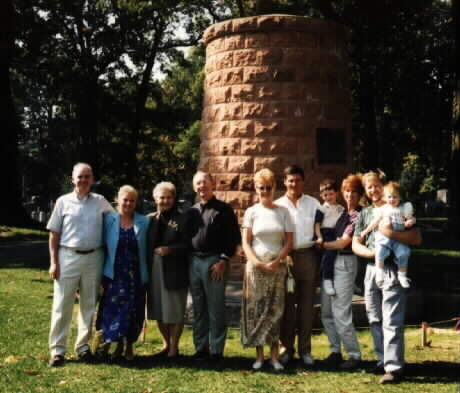 3000 miles away, relatives gather every December at Arlington, where the names of their loved ones are engraved into the marble base of the Lockerbie Memorial Cairn - a unique and powerful tribute to such a devastating loss. Jeff & Jodie Klein with James & Jessica. service for the victims of Pan American Flight 103. President Clinton today promised the families of the Pan Am 103 victims that the United States will keep pressure on Libya to turn over the suspects in the bombing. ``We owe this not only to you, but to all Americans who seek justice,'' he said. Speaking in Arlington National Cemetery at a memorial service on the bombing's 10th anniversary, Clinton said the deal brokered by the United States and Britain for trying the bombing suspects in a neutral third country is "a take it or leave it offer,'' and Libyan leader Moammar Gadhafi would feel repercussions if he continues to balk at the deal's conditions. 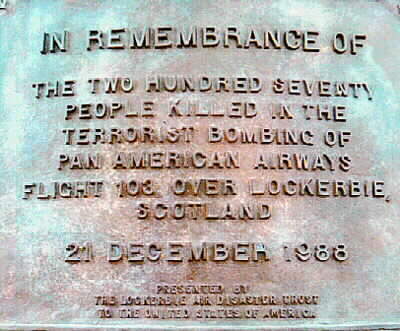 The 1988 bombing of the Pan American World Airways jumbo jet over Lockerbie, Scotland killed 270 people. The suspects are two Libyan intelligence agents, Abdel Basset Ali al-Megrahi and Lamen Khalifa Fhimah. The United States and Britain want to try them in the Netherlands under Scottish law, but Gadhafi has refused to hand them over without a guarantee the men will serve any sentence in Libya. 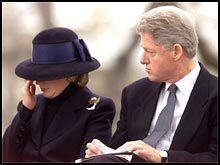 After he spoke, Clinton joined Hillary Rodham Clinton and family members in laying roses on the meorial cairn erected in memory of the 270 victims, as the sun began to peek through a steel-grey sky. The service reflected the compassionate, remorseful stance Clinton has assumed after becoming the first president in 130 years to be impeached. Earlier today, Clinton had only kind words for members of Congress as he ladled spaghetti sauce over a pan of lasagna at the D.C. Central Kitchen. Mrs. Clinton worked beside her husband to prepare lunch for the hungry. Later in the week, the embattled president will gather children around him in the White House's East Room and read holiday stories to them before settling in for a quiet Christmas at home. White House spokesman Barry Toiv said Sunday that Clinton's activities were in keeping with his commitment to community service. "And of course, it's for the holiday season,'' Toiv added. But between the events lies a strategy to pull Clinton's presidency out of the ashes by the time the Senate opens an impeachment trial early next year. In the next two weeks, White House aides plan to seize on the lull in Congress and provide Clinton with forums to talk about his pet legislative topics -- health care, education and Social Security. Aides hoped the images of Clinton being compassionate while advocating popular social programs would help boost public support. An NBC poll conducted after Saturday's impeachment votes in the House found 72 percent of respondents approved of the way he handles the presidency, and aides were aiming to push the popularity ratings even higher by the time the Senate convenes his trial. Howard Baker, White House chief of staff under President Reagan, told ABC's "This Week'' that Clinton demonstrated his ability to focus on his job over the weeks that the impeachment drama unfolded. While Clinton is out displaying leadership, Podesta said, his aides will put a full press on the Senate to come up with an alternative to an impeachment trial and a vote on removing the president from office. To authorize the placement of a memorial cairn in Arlington National Cemetery, Arlington, Virginia, to honor the 270 victims of the terrorist bombing of Pan Am Flight 103. 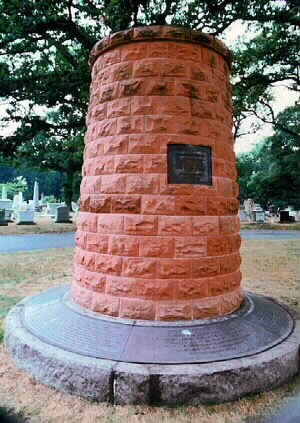 Resolved by the Senate and House of Representatives of the United States of America in Congress assembled, That the President is authorized and requested to place in Arlington National Cemetery, Arlington, Virginia, a memorial cairn, donated by the people of Scotland, honoring the 270 victims of the terrorist bombing of Pan Am Flight 103 who died on December 21, 1988, over Lockerbie, Scotland.